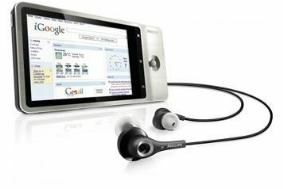 IFA 2010: Philips confirms first Android multimedia player | What Hi-Fi? But news of some of the key product launches is already beginning to leak out, and today Philips has confirmed rumours that it will launch its first Google Android multimedia player, the GoGear Connect. It comes pre-installed with Google Mobile applications and more than 100,000 apps can be downloaded from the Android Market. • Multitasking: Android allows users to multitask, listening to music, looking at maps and using location-based services all at the same time. • Sound isolation earphones, designed to block out external noise. • Philips Songbird: sync your music to your PC via Bluetooth. The player also allows you to stream music or share files. • Built-in camera for shooting videos and still pictures. • A MicroSD card slot for adding extra memory to store more music, movies and apps on the player. On sale in Europe from October, the Philips GoGear Connect is expected to sell for around 249 Euros (£200) for the 16GB version. We'll be reporting live from the Philips press launch at IFA from 2pm on Thursday, September 2nd.